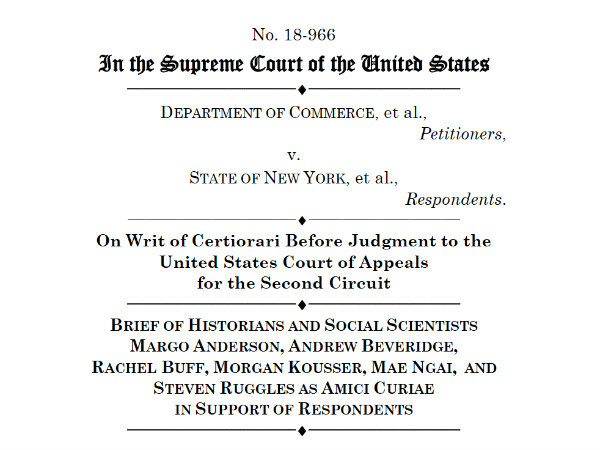 Social Explorer's co-founder and president Andrew Beveridge contributed to an amicus brief of historians and social scientists in the legal case surrounding the controversial new citizenship question that could appear on the 2020 Census. The case will be argued before the Supreme Court on Aptil 23rd. Beveridge and his collaborators are scholars of the census and immigration—historians and social scientists—who aim to assist the Court by providing relevant information about the census and how it has evolved. The Secretary of Commerce argues that his decision to seek the citizenship status of everyone in the United States merely represents a return to past practice. His argument finds no support in the history of the census. The government has never asked for the citizenship status of everyone in the country. Moreover, the census has changed enormously over time, such that a decision made in the distant past to ask a citizenship question is not comparable to a decision to ask a citizenship question today. And in the modern era, the government has consistently rejected suggestions to add a citizenship question to the short-form survey sent to all households. In short, the pre-1960s census practice on which the Secretary relies is inapposite because the census has changed so much since then, and his decision defies post-1960s practice, which is most relevant today. As a result, the Secretary’s argument that his decision merely reinstates a citizenship question is misleading and should not serve as a basis for disturbing the judgment of the district court. Margo Anderson is a leading historian of the census and Distinguished Professor Emerita in History and Urban Studies at the University of Wisconsin, Milwaukee. She has written numerous articles and books about the history of the census. Andrew Beveridge is Professor of Sociology at Queens College and the CUNY Graduate Center. He is CEO of Social Explorer, which provides census data to millions, and he regularly provides analyses of census data to leading news organizations. Rachel Buff is Professor of History and Director of the Cultures and Communities Program at the University of Wisconsin, Milwaukee. She specializes in the history of immigration, immigrant rights, and citizenship. J. Morgan Kousser is Professor of History and Social Science at the California Institute of Technology. Most of his work has concerned minority voting rights and the legal and political aspects of race relations in the 19th and 20th centuries. Mae Ngai is the Lung Family Professor of Asian American Studies and Professor of History and is a U.S. legal and political historian who specializes in studies of immigration, citizenship, and nationalism. Steven Ruggles is Regents Professor of History and Population Studies at the University of Minnesota, and the Director of the Institute for Social Research and Data Innovation. He is best known as the creator of IPUMS, the world’s largest population database.